The St. Louis Cardinals lost for the fourth time in their last five outing, dropping the opener of a series with the Milwaukee Brewers 4-3 Friday night at Miller Park. Jonathan Villar hit a game-ending RBI single with two out in the ninth to lift Milwaukee to the win. Villar’s hit, off Seung Hwan Oh, got past diving third baseman Greg Garcia. Left fielder Tommy Pham’s throw to the plate was on line and Yadier Molina slapped a quick tag on Kirk Nieuwenhuis as he slid. The home plate umpire ruled Nieuwenhuis safe, leading to an argument from Molina. The call was confirmed after a brief replay review. 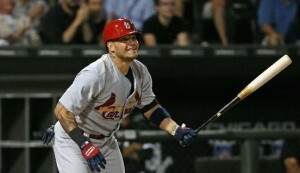 Molina hit his second home run of the season in the loss for the Cardinals in the eighth inning to tie the matchup at three. Aledmys Diaz and Matt Holliday each drove in a run for the Cardinals.